High Vacuum Transformer Oil Purification Plant model СММ-12.0 purifies insulating oils of mechanical particles and employs thermal vacuum for water and gas removal. Operate the Unit when assembling, servicing and exploiting oil filled equipment (power transformers, high voltage switches, etc.) up to 1150 kV of voltage. 3.1.1 The Unit (figure1.1) is an assembled container keeping all the junctions, components and aggregates. Container is the one biaxial trailer mounted. Side as well as back wall is flap door mounted for unobstructed access and fanning. Gas springs are employed to open the doors. Unit is supplied mounted on two-axial trailer equipped by torsional suspension axels, pneumatic wheels, coupling loop, support jacks, pneumohydraulic braking system, parking brake hand lever and electrical equipment. The Unit performs vacuum chamber (column) 1, inlet oil pump 2, outlet oil pump 3, coarse (preliminary) filter 4, fine filters 5, oil trap 6, oil heater 7, pipelines mounted with shut-off valves and adjusting fittings, vacuum pumps cluster and control cabinet 8 as well. 3.1.4 Fine filters 5 (figure 1.2) filter the oil to be treated. Oil filtration fineness is 1 micron. For filter overview watch figure 3. 1 – inlet oil branch pipe; 2 – outlet purified oil branch pipe; 3 – sludge drain valve; 4 – filtering cartridge; 5 – air release plug; 6 – magnets; 7 – clamping lever. The filter is lid and frame keeping two filtering packages inside. Filtering packages are made of EFMG filtering elements. To eliminate air within oil gain as well as to swallow it within oil drainage, filter uses air relieve plug. Body bottom is mounted with valve keeping branch pipe. Inlet and outlet oil branch pipes are body welded. Flow relay FR indicates operational fluid flow to prevent heating section failure and oil overheating. Heater is interlocked by a flow switch and is being energized only when oil is flowing through it. Heater is equipped with separate thermostat TR for extra-control and protection against overheating. 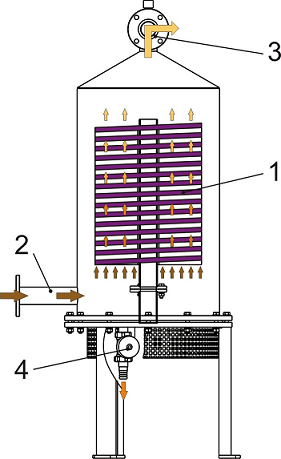 3.1.6 Vacuum column 1 (figure 1) efficiently dries and degasses under vacuum the transformer oil by the thin-film principle. It performs body 1, cover 2, oil spray system 8, inspection window 6 and oil indicator 11 for visual oil level control as well as oil level sensors 7 (figure 5). Ball valve 10 gains air in if necessary. 1 – body; 2 – cover; 3 – vacuum system joining branch pipe; 4 – inlet oil branch pipe; 5 – treated oil outlet branch pipe; 6 – inspection window; 7 – oil level sensors; 8 – polypropylene sprayers; 9 – vacuum sensor; 10 – air input valve; 11 – oil indicator. Column (see fig. 5) is mounted with oil trap (see fig. 6 for general view) which joins vacuum valve to get vacuum system connection, vacuum sensor VR1 (9) and oil level sensors L1 – L3 (7) as well as foam detection system. While degassing oil, manage residual pressure less 267 Pa inside the column. Once supplied by pipe to the column, oil streams to oil collector and sprayer system. Sprayer design allows for intensive moisture and gases discharge. 3.1.7 Oil trap 6 (figure 1.3) prevents vacuum system of treated oil entrance. For trap overview watch figure 6. Trap is a metal case 1 welded with branch pipes to join vacuum column 2. and vacuum valve 3. The case keeps oil indicator 4, oil level sensor 5, emergency vacuum release solenoid valve 6 and oil drainage valve 7 placed in lower section. 3.1.8 Control cabinet supposes allocation of electrical elements allowing for Unit’s operation. 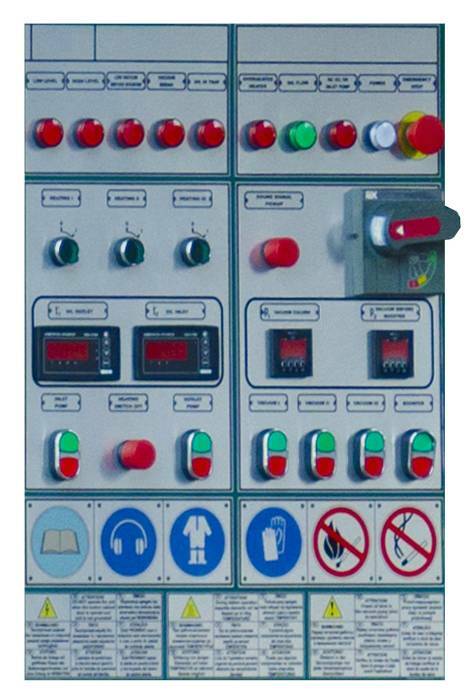 It is a metal case with lockable doors and is so located that the operator can stop, start and monitor all motors from this panel and to control at the equipment. All necessary instruments to monitor the complete process are located on the control panel. Cabinet’s inside panel contains electrical control and commutation circuits. Unit control switches and buttons as well as light alarm are installed on the cabinet. Upper section keeps space for power supply cabling. Pressure controllers to indicate fine filters pressure are top panel mounted. onsite evacuation and drying of solid insulation of HV transformers. 3.1.10 Controllers. Column residual pressure is controlled by electronic vacuum controller RVE-4.1. Limit of effective measuring is 0,133÷105 Pa.
Ball valves V3 and V4 at cartridge filter FP1 outlet allow to heat transformer with hot oil as well as to filter and circulate the oil. Ball valve V6 joins cartridge filter outlet FP2 to oil heater Нinlet for closed loop treatment of oil batch inside vacuum column VT and for Unit operation adjustment as well. Warranty period is 12 months from the date of shipment.